What is better than a chilled dessert on a hot summer day?! 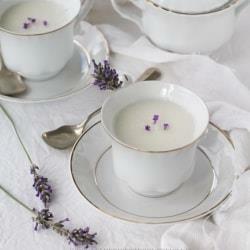 Enjoy our lavender panna cotta recipe and please share a photo of how yours turns out! Add 3 tablespoons water to a small bowl and sprinkle gelatin over the water. Set aside to soften, stirring occasionally to prevent lumps. Strain lavender from cream and return to saucepan. Bring to a boil over medium heat. Add softened gelatin and sugar and stir vigorously until well combined, then remove from heat. Add vanilla and salt. Strain mixture into a container with a pourable spout. (To check that your gelatin has set properly, chill a plate in the freezer until very cold. Drip a few drops of finished hot panna cotta mixture onto the plate, then set it in the refrigerator for 5 to 10 minutes. With the tip of a spoon, push on the drips. If they wrinkle, they are perfectly set. If they are still liquid, you must add more gelatin. If they are too hard, add more liquid). Divide cream mixture evenly between serving dishes. Refrigerate and chill until set, 6-8 hours. Garnish with a drizzle of honey and shaved white chocolate. Makes eight 1/4 cup portions.